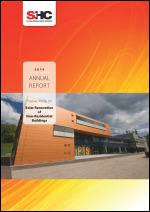 I’m happy to report that the SHC 2014 Annual Report is now available online. 2014 proved to be a year of growth and new frontiers for the SHC Programme. We welcomed four new members from across the globe –Gulf Organization for Research & Development (GORD), Regional Centre for Renewable Energy and Energy Efficiency (RCREEE), Turkey and the United Kingdom. We held our international conference in China. We started two new Tasks to tackle solar thermal and energy economics in urban environments and new generation solar cooling and heating systems. We completed two Tasks that have contributed valuable results in the areas of solar renovation in non-residential buildings and polymeric materials for solar thermal applications. In 2014, I also began my term as SHC Chairman. I am following in the footsteps of a very active Chairman, Werner Weiss, and look forward to building upon what he accomplished during his term. In terms of solar thermal technologies, there were many bright spots – solar thermal district heating is booming with Denmark leading the way, installations of solar thermal systems for industrial production processes reached 132 and continues to grow with systems throughout the world, and 120 solar thermal cooling systems were installed and technology innovations are creating a stronger and more sustainable market. All these advances and others are supported by the improvements being achieved in the field of solar resource assessments –forecasting, data collection and solar model improvements. The SHC Programme, with more than 300 experts from over 20 countries, is dedicated to the growth of solar thermal and through our work and collaboration with other organizations we look forward to sunny future. Solar Heat Worldwide, is a primary source for the annual assessment of solar thermal. The report is the leading data resource due its global perspective and national data sources. The installed capacity of the 58 documented countries represents 95% of the solar thermal market worldwide. SHC 2014: International Conference on Solar Heating and Cooling for Buildings and Industry, our international conference series provides an opportunity for experts to gather and discuss the trending topics and learn about the work others are doing in the field. The 3rd SHC conference was held October 13-15 in Beijing, China and welcomed some 200 participants from 30 countries. The conference program included 84 presentations, including 15 keynote lectures, and 77 scientific posters. Our prestigious SHC Solar Award recognizes individuals, companies and institutions that have made significant contributions to the growth of solar thermal. The 2014 SHC Solar Award recognized an outstanding municipality – the City of Montmélian, a solar thermal pioneer for more than 30 years. The award was presented at SHC 2014 in Beijing. SHC book series, published by Wiley-VCH, shares our results with a broad audience. The published books include the first book ever published that is devoted to polymers for solar thermal applications and in early 2015 a book on Modeling, Design, and Optimization of NetZero Energy Buildings and one on Solar and Heat Pump Systems for Residential Buildings. Each of these activities serve as a means to inform policy and decision makers about the possibilities of solar thermal as well as the achievements of our Programme. Please take a moment to learn more about these activities and our work. Our website, www.iea-shc.org is a good starting point. Also, come learn and share in Istanbul, Turkey at SHC 2015: International Conference on Solar Heating and Cooling for Buildings and Industry on December 2-4. The Executive Committee is happy to organize this conference in cooperation with the Turkish ISES Section, GÜNDER and ESTIF. Conference details can be found at www.shc2015.org. In closing, I would like to thank Werner Weiss for guiding and pushing the SHC Programme to broaden its work, its dissemination activities and its membership for the past four years. I also would like to thank my Vice Chairmen, He Tao and Daniel Mugnier, the members of the Executive Committee, the Operating Agents of the Tasks as well as all the experts working in our projects, the Secretariat, Pamela Murphy, and the Webmaster, Randy Martin. I look forward to my two years as Chairman and to the support of the Executive Committee and Operating Agents as I coordinate this work from Australia.